Properties: Food grade hose liner and cover to eliminate leaching risk of those components into the delivered substances. 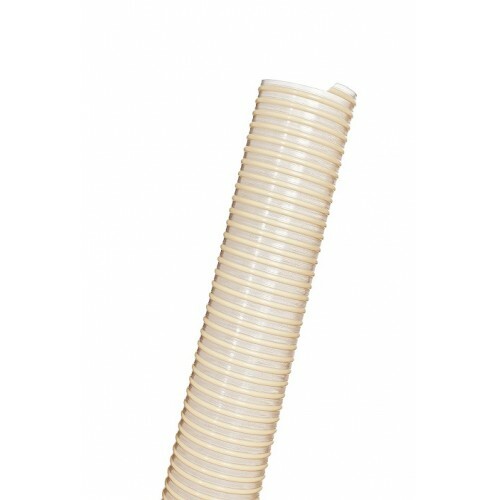 The hard plastic spiral is as well food grade, making Nettuno PU FF a total food hose. Resistant to abrasion, weather conditions, UV rays, ozone, hydrolysis and most chemicals. Halogen free and conform to RoHS as well as free from phthalates. Standards: Food grade according to EU Regulation 10/2011 ( Classes A,B,C,D and dry food). Not suitable for milk and dairy products, RoHS 2011/65/EU Directive, REACH Regulation (1907/2006), TRB S 2153. Ideal solution for suction and delivery of liquids and dry food such as beverages, juices, vinegar, wine and liquors up to 20% alcohol content, flours, animal feed, sugar, flour etc. Suitable for fatty foods, but not for milk or dairy products.